This congress will feature interactive case-studies, platform presentations, educational workshops, networking session and more. Qatar International Musculoskeletal Medicine & Rehabilitation Congress is the first leading platform for musculoskeletal and physical medicine in the GCC region. The congress will be held during 12-13 May 2017 in Doha, Qatar. The 2-day congress is the main platform in the gulf covering latest trends and developments in the field of musculoskeletal and rehabilitation. The congress aims to improve the quality and effectiveness of rehabilitation and discuss the latest updates in the prevention and management of musculoskeletal health problems. It cover various fields related to physical medicine including musculoskeletal medicine, neuro muscular medicine, paediatric rehabilitation, chronic pain rehabilitation and more by gathering the leading regional and global experts in the field. This congress will feature interactive case-studies, platform presentations, educational workshops, networking session and more. 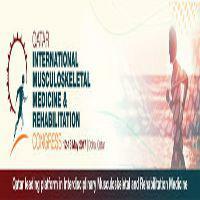 You will have the chance to meet and connect with the leading experts from all over the world in this leading platform, from physiatrists, orthopaedic surgeons, physiotherapists, sports medicine consultants and more.